Monday, April 18, 10 a.m. EDT. This is the best evening apparition of Mercury for 2016 for observers in the Northern Hemisphere. April is a month of goodbyes and hellos for the "inferior" (inner) planets. Venus takes a sabbatical for the remainder of the spring and into the first half of summer as it slowly sweeps behind the sun as seen from Earth — much too close to the solar glare to be seen. Mercury, on the other hand, says "hello" early this month; it remains in good position to be glimpsed in the western twilight sky until late in the month, when it sweeps back into the glare of the sun. Jupiter is prominent during the evening hours, and Saturn and Mars are coming into view during the premidnight hours. Saturn's rings are spectacular even when viewed in a small telescope, while Mars brightens dramatically as it continues to draw closer to Earth. April 4 – Venus, currently visible, will become invisible in the months ahead. 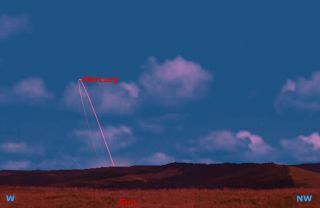 For most of us, Venus is already very low near the eastern horizon within a half-hour of sunrise in the bright dawn sky — or perhaps a better way to describe it is that it's buried deep in the dawn light. Therefore, during April, Venus is difficult or impossible to see. The planet is best seen from the Southern Hemisphere. For the rest of us, it will stay hidden in the sun's glare for an unusually long time; not until July or August will it emerge very low in the sunset for observers around 40 degrees north. April 8 – Mercury emerges from beyond the sun and into the evening sky this month. It can be glimpsed very low in the western sky about 30 or 40 minutes after sunset as April opens. In a telescope, Mercury appears as a gibbous disk and is shining at a brilliant minus 1.0 magnitude (making it nearly as bright as Sirius, the brightest star in the sky). This evening, look low to the west-northwest for Mercury about 7 degrees to the right and slightly lower than the slender sliver of the crescent moon. Mercury just passed the perihelion point of its orbit, when it's closest to the sun, on April 5 and is thus moving rapidly, becoming more favorably placed with each passing day. April 17 – Jupiter was at opposition on March 8 — opposite the sun in Earth's sky — so it remains very bright, big and accessible for most of each April night from its location in south-central Leo. It's already very high in the south-southeast as evening twilight arrives, and it's the first "star" you're likely to see each evening. Even modest instruments show it brimming with a rich assortment of features in its clouds. This evening, you'll see it closely accompanying the waxing gibbous moon across the sky during the night. April 24 – Mars, in the constellation Ophiuchus, rises this evening before 10:30 p.m. local daylight time and dominates the south-southeastern sky the rest of the night. Already more than twice as bright as nearby Saturn as April opens, at a magnitude of minus 0.5, Mars more than doubles in brightness to a magnitude of minus 1.4 by month's end, practically matching Sirius as it continues to approach Earth. In a telescope over that time, its disk grows by some 25 percent. During the overnight hours on this night, Mars will appear as a brilliant orange-yellow "star" hanging about 5 degrees below the waning gibbous moon. April 25 – The moon, which hovered above Mars the previous night, is noticeably farther off to its east on April 25. But almost midway between the two is a "star" shining brightly yellow; in actuality, it's the planet Saturn. The ringed wonder, whose opposition will occur next month, comes up at around 12:30 a.m. local time by the start of April and just before 10:30 p.m. by month's end. As with Mars, Saturn can be found in the large, dim constellation Ophiuchus, about 8 degrees northeast of the red star Antares in the neighboring constellation of Scorpius.